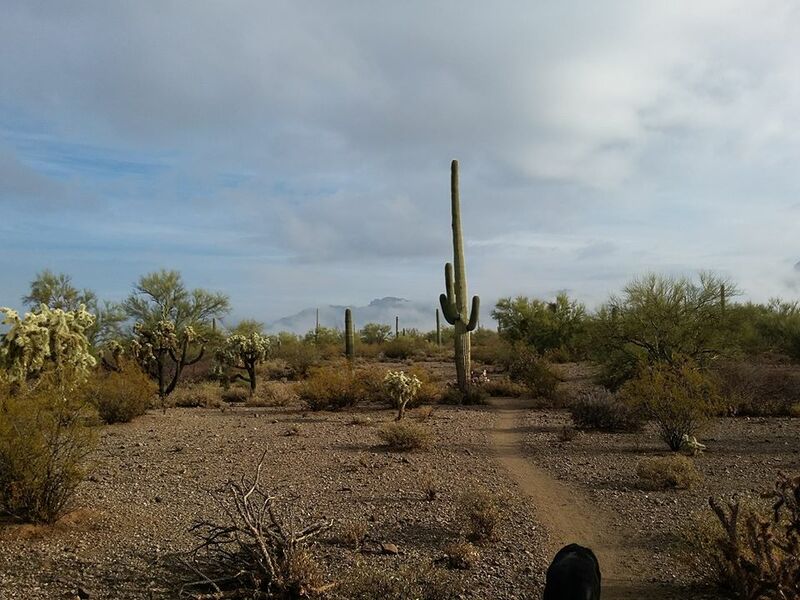 March 4, 2018—-Each morning I ride along the dirt paths in southwest Arizona, my dog in tow, and wonder at the giant Saguaros, towering, as if royalty of the desert. What do I know about these gigantic, human like plants? I know I am truly humbled by their presence. The beauty against the mountains, the size, the human like features of arms lifting to a blue sky above, their age and, while the world moves forward, these mammoth cactuses have survived the elements of a dry arid life in the Southwest…all part of my fascination! But what about the survival of the Saguaros? What is the future of these majestic desert plants? With climate change comes a hotter, drier desert and with a hotter, drier desert comes a greater risk of fires and drought, making it difficult for the Saguaro to propagate according to the narrow margin of time allotted for seed dispersion that coincides with the monsoons. Buffelgrass is native to Africa and was transported to the desert of Arizona to prevent erosion and for cattle forage in the 1940’s. Many volunteers work tirelessly digging up the invasive grass, which competes with the Saguaros for food and water. The grass not only competes for the nutrients and water among the Saguaros, it is also fire-resistant, as the roots are able to survive a fire, allowing the Buffelgrass to endure the elements of nature and return healthier than ever. Buffelgrass is highly flammable and burns very hot, much hotter than the Saguaros can survive. It changes a fire-resistant desert into a flammable grassland and, as climate changes and fires increase, so does the Buffelgrass. 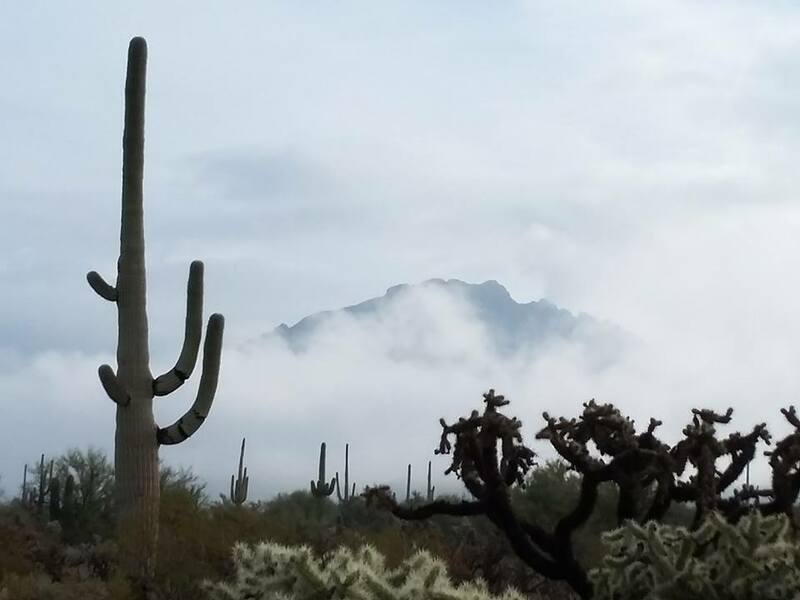 A healthy ecosystem is able to resist changes of climate due to global warming, but the buffelgrass creates an unhealthy environment for the Saguaros of the Sonoran Desert. When it fills in the bare areas between the Saguaros, the grass acts like fodder for fire caused by lightning strikes. 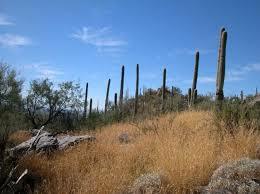 The Saguaros only habitat on earth are the deserts of the southwest. Andy L. Fisher, chief of interpretation for Saguaro National Park says, “Even — or especially — in the desert, water is life. Saguaros have evolved to rely on the summer monsoons and winter rains that prevail here. Their adaptations to this regional weather cycle are so specific that the species is found in the Sonoran Desert and nowhere else on Earth. The saguaros have got it dialed in. They know exactly when they need to put up the fruit to put out the seeds, to get the seeds carried by the animals, to get seeds deposited just in time for the first monsoon rains.” If the monsoons fail to bring the needed rains within their usual timespan, these cactuses could soon become extinct, along with the many other species of plants throughout our planet dependent on timely conditions for survival. A seventy-five year study of the Saguaro cactus by the National Parks Conservation Association titled, “Saguaro Mortality and Population Regeneration in the Cactus Forest of Saguaro National Park: Seventy-Five Years and Counting,” created maps showing the percent of population change of the Saguaros according to sections. The study shows that only 12 of the 64 four-hectare (one hectare equals approximately 2.5 acres} plots had a population increase over the past 75 years in which the Saguaro was studied. The other 52 plots decreased in Saguaro population. Other studies document the same degree of regeneration. The observations made during the past 75 years of this study suggest that the success of the Saguaro’s regeneration in the 21st century will depend on a combination of factors including climate and fire associated with the invasive non-native buffelgrass. Climate change may benefit some species, such as Buffelgrass, and cause extinction of others….the Saguaro, which is at risk of disappearing in the future! One last note, don’t try to poach a Saguaro to sell or relocate to your yard, as many are microchipped! Categories: Climate Change, Extreme weather, Sustainable Education | Tags: #climatechange, Climate change, Global Warming, Saguaros | Permalink.